Karl Heinrich Marx (May 5, 1818-March 14, 1883) was a Prussian philosopher, political economist, author and revolutionary socialist. His ideas played a significant role in the development of social science and the socialist movement. 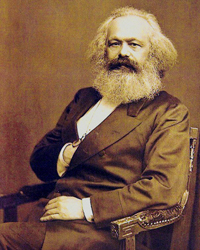 Karl Marx believed that capitalism would be replaced by socialism which in turn would bring upon communism. While Karl Marx was a relatively obscure figure in his own lifetime, his ideas began to exert a major influence on workers’ movements shortly after his death. This influence was given added impetus by the victory of the Marxist Bolsheviks in the Russian October Revolution, and there are few parts of the world which were not significantly touched by Marxian ideas in the course of the twentieth century. The relation of Marx to “Marxism” is a point of controversy. While some argue that his ideas are discredited, Marxism remains influential in academic and political circles. Following the death of his wife Jenny in December 1881, Marx developed a catarrh that kept him in ill health for the last fifteen months of his life. It eventually brought on the bronchitis and pleurisy that killed him in London on March 14, 1883. He died a stateless person and was buried in Highgate Cemetery, London (http://www.highgate-cemetary.org/), on 17 March 1883. The message carved on Karl Marx’s tombstone is: “WORKERS OF ALL LANDS, UNITE”, the final line of The Communist Manifesto. Karl Marx has become my guiding light and must post-humously, and thus unknowingly, take responsibility for the creation of Where Angels Fear to Dream. It was my original intention to write a musical or play in celebration of the Karl Marx centenary at Alexandra Palace, North London in 1983 – I never quite made it! The final result is my tribute to the memory and beliefs of a man who has, and still does, inspire the thoughts of many a man and woman. He took a much, much deeper view. You have to take the lead. Could not bear to hear him speak. And they were very weak. But he brushed it all aside. As whole books have been written in tribute and dissection of Marx, his philosophies and theories, the above provides only some basic facts. My poems are simply my personal and respectful interpretation of Marx and Marxism and are written in honour of the man himself and all those who have followed his teachings and fought for the cause over many generations.